A short list of articles related to homebuyers, remodeling, and everyday life that could be helpful for individuals with disabilities. 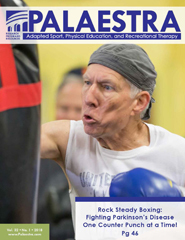 PALAESTRA is now accepting manuscripts that focus on applied research, exemplary programs, practical applications, and resources for educators and practitioners. Manuscripts will go through a double blind review process.